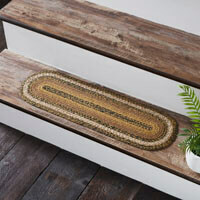 We are pleased to offer your On Trend Floor Rugs from the VHC Brands. 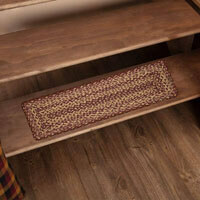 Whatever your need, we have the design and size rug to make your space warm and inviting. 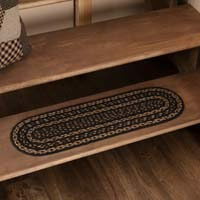 We currently offer rug designs in Oval, Rectangle, Half Circle, Round Circle and even stair treads. 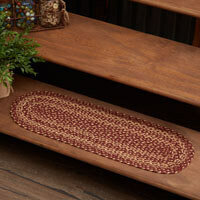 Enjoy our beautiful Jute Rug Collection which are not only available in floor rugs but many designs are available in tabletop pieces and accessories. 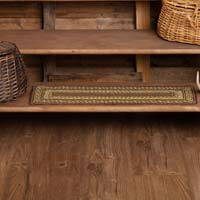 Choose from Natural color jute which has been woven into a pleasing neutral-palette which is perfect for rustic, transitional or beach settings or fall in love with our color jute rugs offering bands of complementary colors and designs all created with concentric braids which have been machine braided and stitched from natural jute, a sustainably harvested fiber. One of our absolute favorite rug designs this year is the Celeste design which is pictured above in the 3rd photo from the left. Celeste is a show stopper with alternating rows of solid and circular braided natural jute available in rugs of Oval, Half Circle, as well as Kitchen/Tabletop pieces and new for this year rugs in Circle Round. Dare for something out of the ordinary with our new circle shaped jute rugs that are available in 3 sizes, 3ft, 6ft and 8ft in many designs and colors in addition to our favorite, Celeste. You'll be impressed by our Printed Cotton, Hand Woven Cotton & Jute, Wool & Cotton, Kilim, Chindi, Rustic Patriotic, Patchwork and Rag Rug Collections. Take a peek and if you have any questions we would love to help you with your selections. 1 - 12 of 85 Items Displayed.